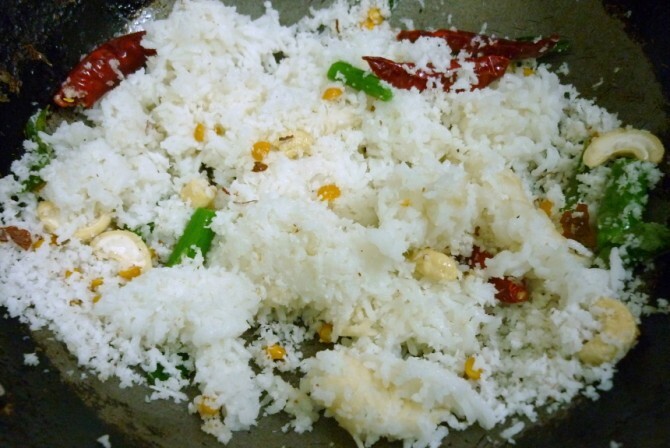 For the Navaratri Pooja Day 7, the neivedyam was a mix of white (Thenga Sadam), spicy mixed rice (Parruppu Podi Sadam) paired with a intoxicating payasam made with Gasagasa. 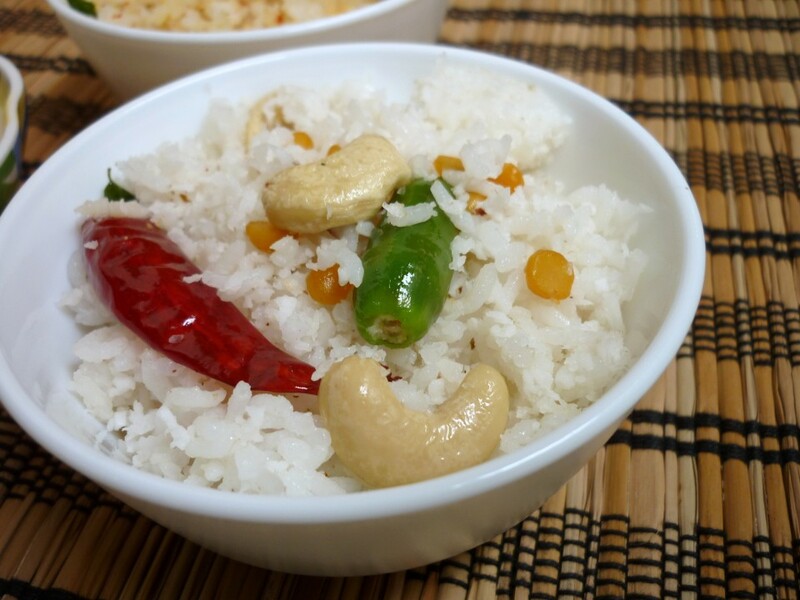 I love cooking with Khus Khus as it renders a nutty taste when you bite on it. However much you try to grind this, you will still have some left as whole. A decade ago, we had those traditional stones for making masalas, chutneys. Every home had those stone grinders, which gave the masala an unquie taste. However we try with modern blenders, mixers, the masala never tastes as how it used to taste. Anyway for folks who never tasted food made with those grinders will never know the magic it created. One example of how different an ingredient can lend will be Poppy seeds. These days we roast in bulk and refrigerate in powder form. It’s so much better than struggling to grind 1 or 2 tsp of this nutty spice. 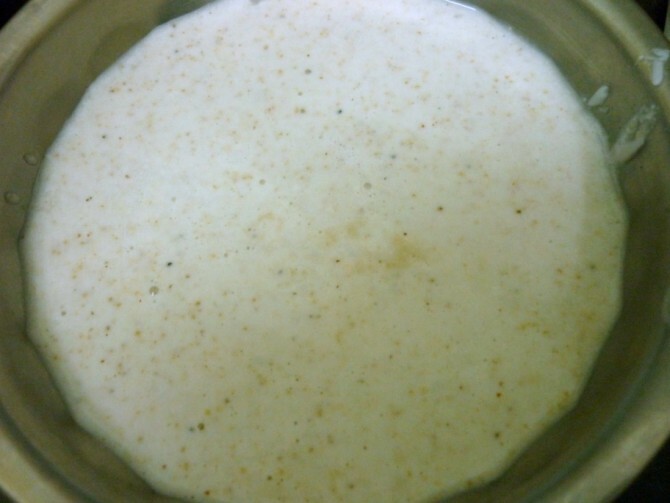 We make it either on it’s own or blend with coconut for using in non veg gravies or veg kurmas. 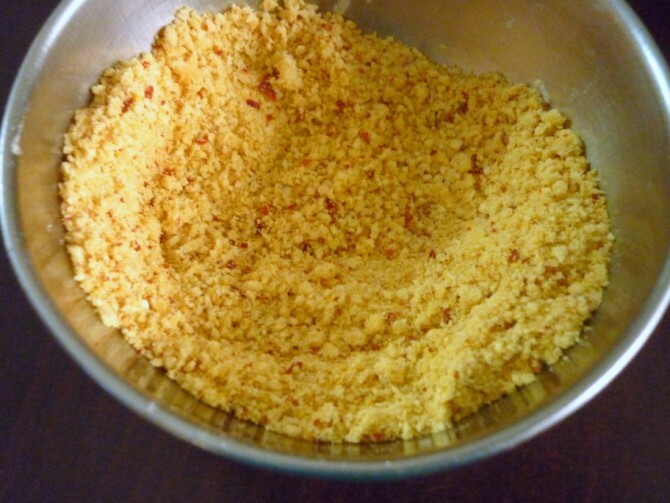 The other new dish that was prepared today was the Paruppu Podi Sadam. I was told to make Paruppu Sadam. Well I wasn’t sure what exactly was referred when this rice was quoted. 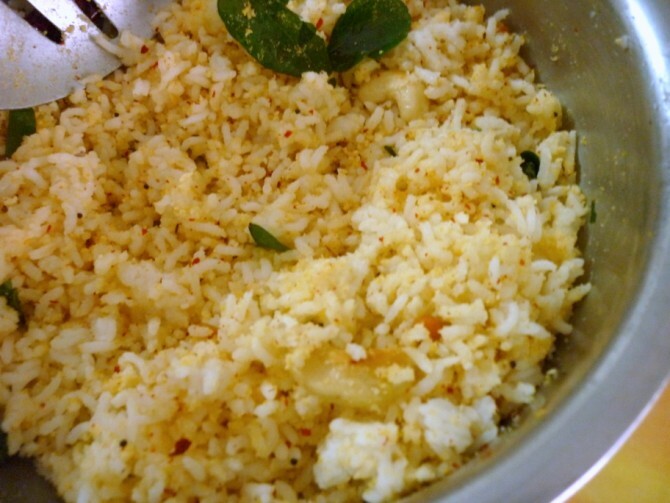 But the essence being that the rice ought to be shades of white, I decided to go ahead with Paruppu Podi Sadam. Let me just say I am floored with this dish. 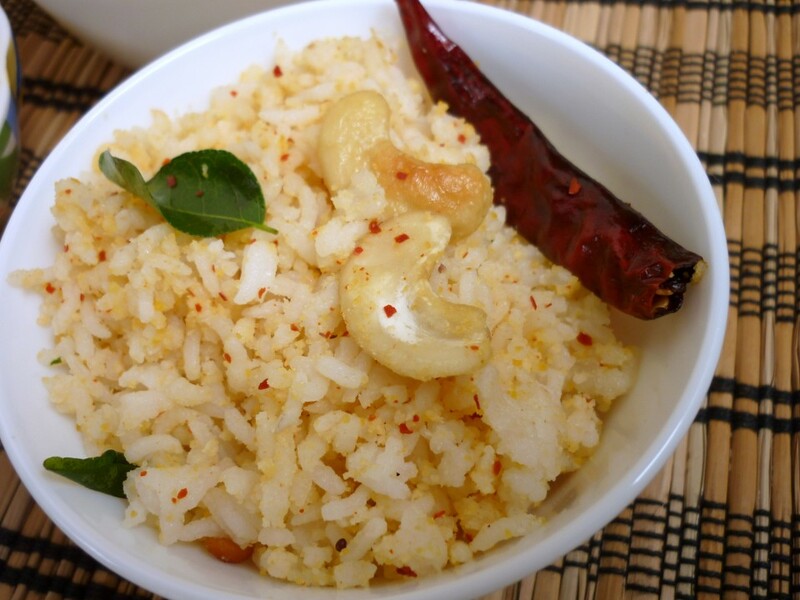 Though it might very well resemble the Podi Rice that I make with Amma’s Podi, it very much differed in taste and texture. The third dish was the traditional Thengai Sadam. I love Thengai Sadam and have been missing it as I hardly make it these days. Hubby dear doesn’t like it and well naturally if 1 out of 2 doesn’t prefer a dish, makes no sense in bothering to make it. But today it is different, as it’s to be offered as neivedyam, one can’t say no for it. 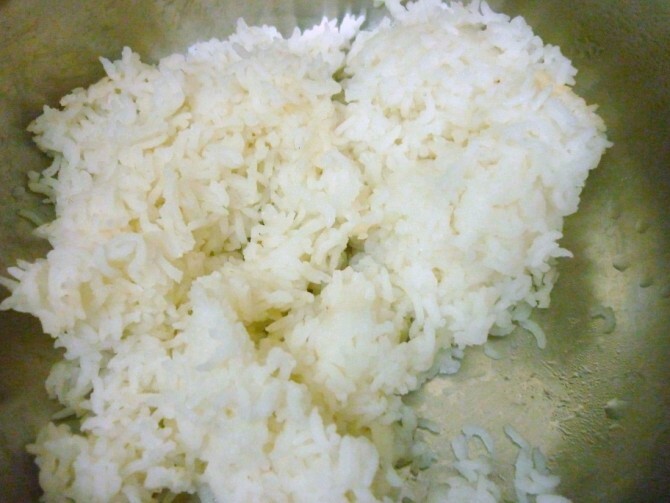 Since both rice requires for cooked rice, I cooked rice separately and used 1 & 1/2 cups for each rice. Dry Red chilies – 3 -4 long. 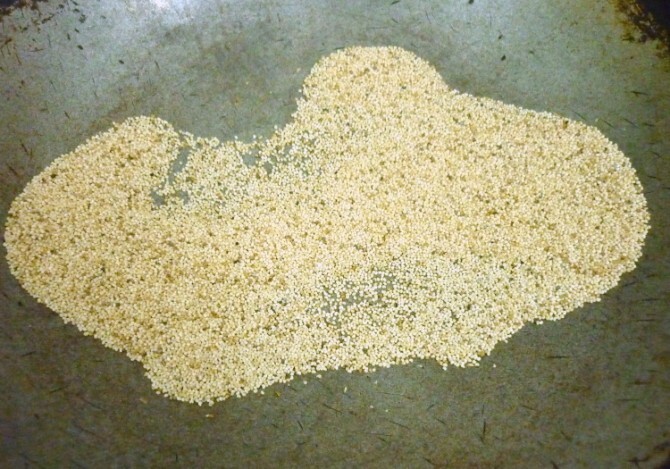 Wash and soak rice for 15 – 20 mins. Pressure cook and once done, let the pressure fall down. Take 1 & 1/2 cup cooked rice, allow it to cool. Dry roast all the ingredients till the lentils start smelling good. Remove and allow it to cool. We mostly roast these ingredients separately but when pressed for time, roast them together, making sure none get burnt or over roasted. Once it’s cooled, add salt and grind to an almost fine powder. Keep it aside. Heat a non stick pan with oil. 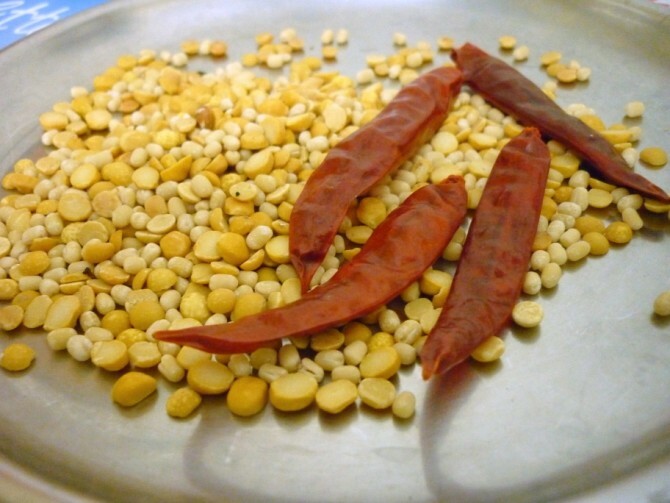 Once hot add the mustard, urad dal, cashew, red chilies, curry leaves. Saute well. When they are sauteed for couple of mins, add the cooked rice and mix well. 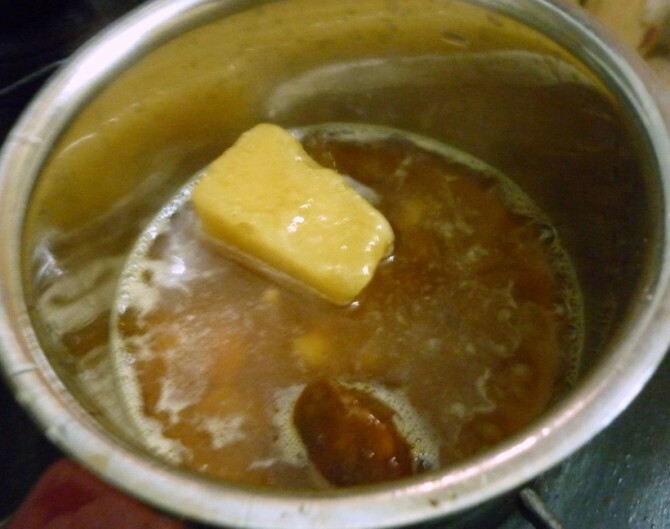 Simmer for 2 mins and remove to a bowl. Now add 3 – 4 tsp of the spice powder and mix the rice. Add more if required. Since this is offered to God, I didn’t taste it. There was a time when I was of the opinion that there is no wrong in tasting the food offered to God, just to make sure that it’s fine. Well with time and age, I have come to believe that one need not taste, for one, the dish turns out perfectly delicious as it’s food for God. Second with experience one gets to knows how much to add what. Thengai Sadam was prepared the same way I normally make. 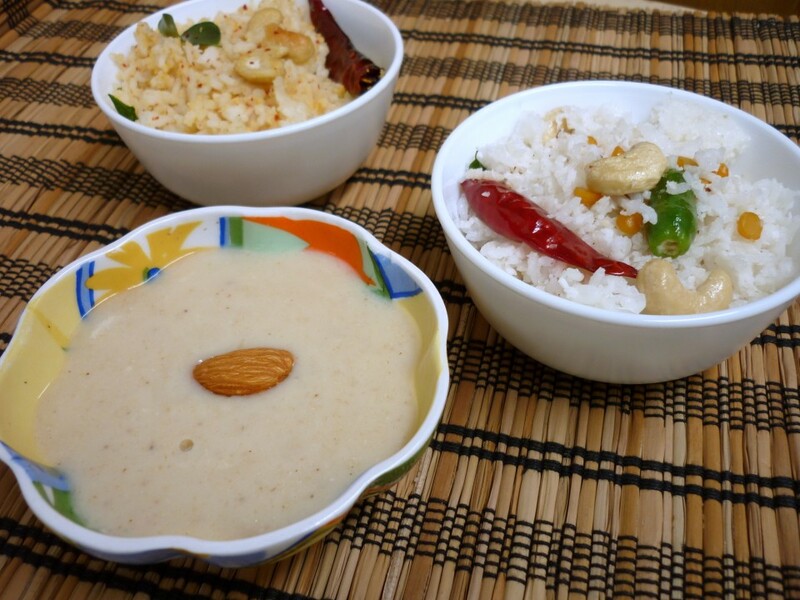 While there are many ways this Gasagasal Payasam is made at home, this version is entirely new as it’s more like a Phirni, where Raw rice is added to give body. Adding rice makes it thicker much faster than you can notice, so one fact to remember, is to add little of rice and more of milk, if you want it thin. Heat a pan and dry roast the poppy seeds. This takes about 3 -4 mins. 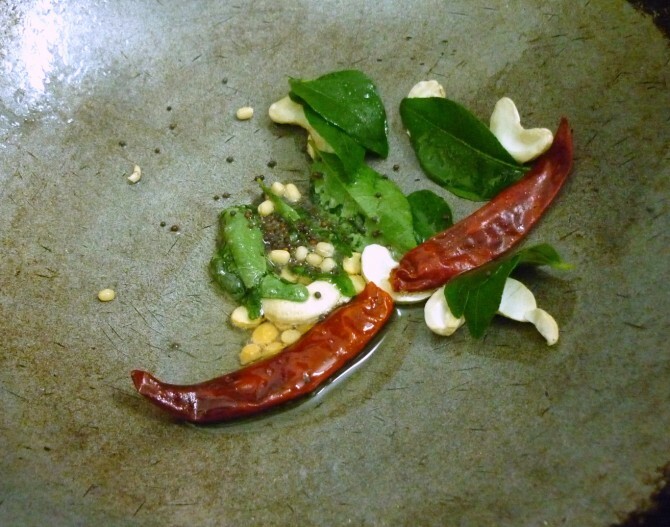 Transfer to a plate and allow it to cool. Soak rice in water for a while. 10 – 15 mins is more than enough. 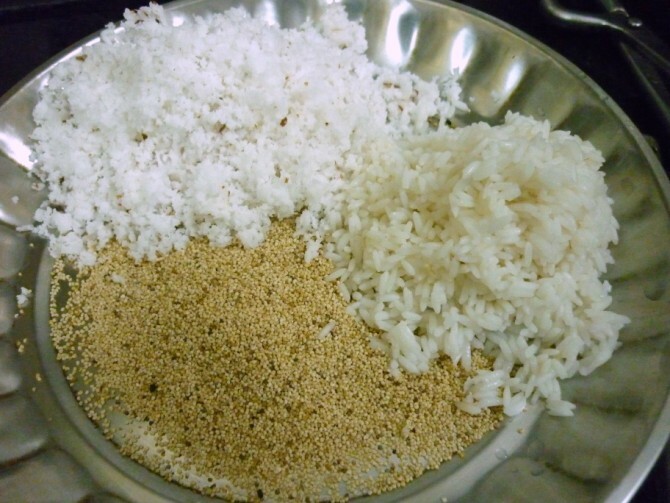 Take the poppy seeds, drained rice, grated coconut and blend to a smooth paste using water. Once you get a smooth consistency, remove and keep it aside. 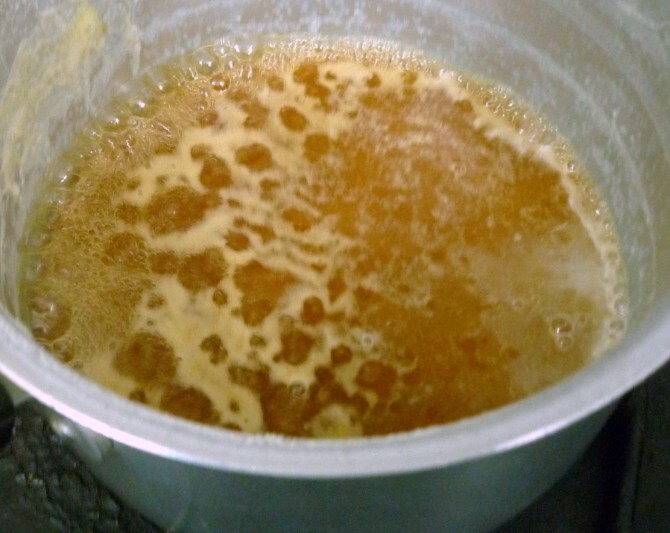 Melt the jaggary and remove impurities if any, then add 1 cup water and bring to boil. Add the poppy seed paste and simmer for 5 mins. By this time the content would’ve got really thick. 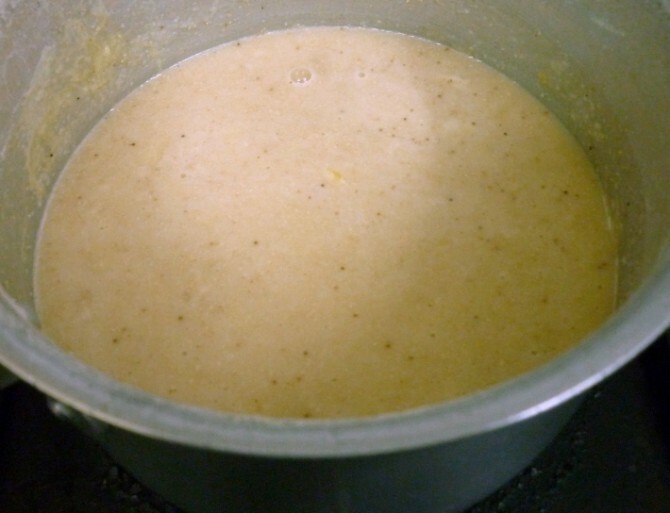 Add boiled milk and slowly bring to boil. 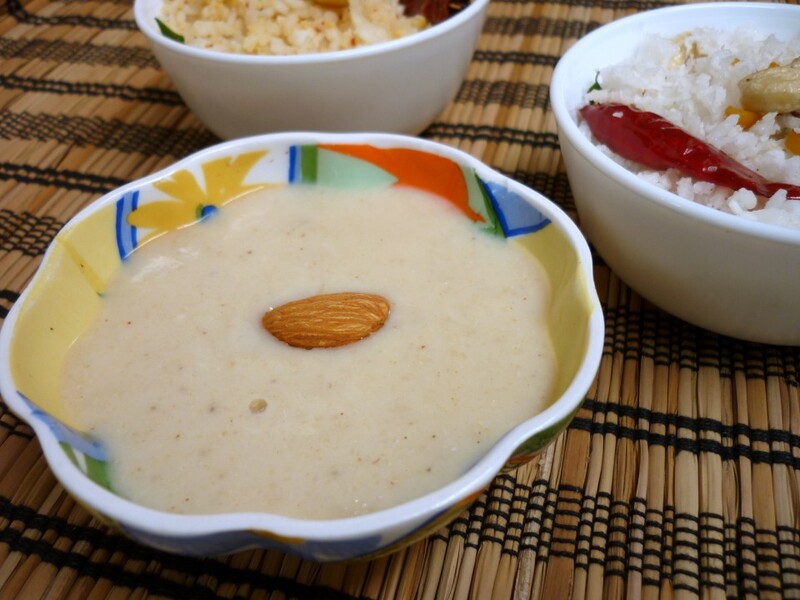 If you feel the payasam will be less in sweet, add 2 tsp of sugar. Else it’s fine. 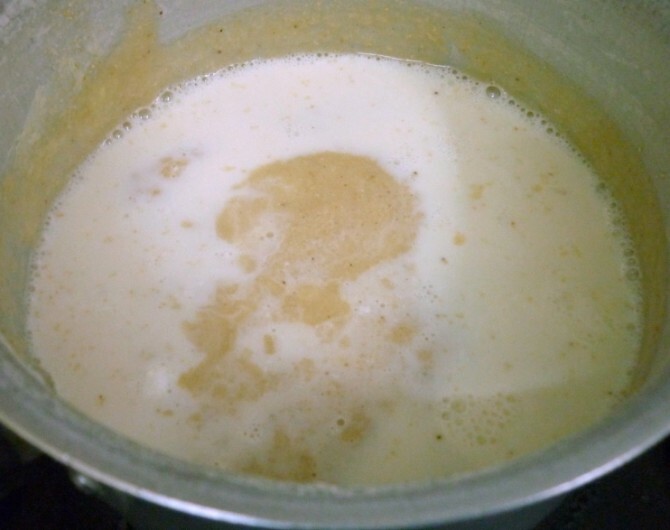 Let it boil, by looking at the texture you can say if the payasam will thicken to a porridge or not. So if needed add more milk or water depending on your preference. Finally garnish with chopped nuts. There is really no need to add ghee to this, as the poppy seed will have it’s unique taste and it will be really heavy. 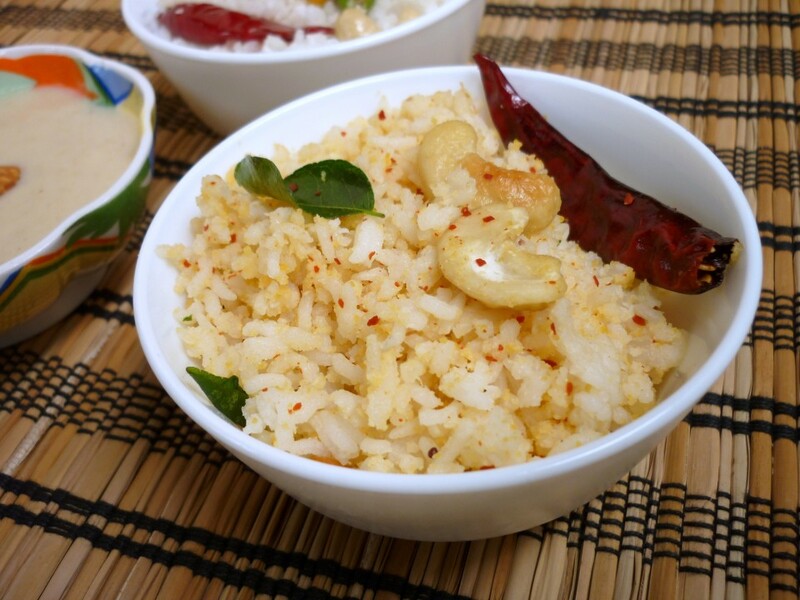 My fav dishes together, seriously makes me hungry..
heard about gasgasalu payasam a lot…need to try it out!